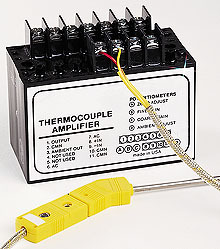 The OMEGA™ OMNI-AMP IV thermocouple amplifier is a high performance rugged epoxy encapsulated thermocouple amplifier with built-in power supply. Models are offered for either type J, K, T, E thermocouples or R,S,B thermocouples. Only the highest quality industrial components are used for reliable and long operation. Connections are made with an ordinary screwdriver to rugged terminal strips. The amplifier can be mounted using the bolts supplied with the unit.